Hello everybody! We have something rather exciting today! We were recently joined by the wonderful Lee Chapman of Sonarworks and Nathan Baglyos of Kali Audio to calibrate a pair of Kali LP8 studio monitors using Sonarworks Reference 4 software! Several months back we had the chance to review both Kali LP-6 monitors and the Sonarworks Reference 4 and were very impressed by both! 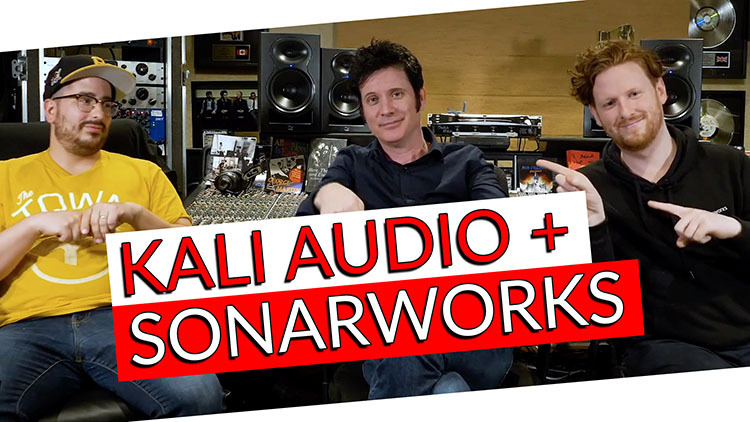 Today we’re going to have Lee walk us through the setup of Sonarworks Reference 4 and calibrate the sound of Kali Audio’s LP-8 monitors – It’s going to be wonderful! Sonarworks corrects in frequency response domain but there’s also lot happening on the speaker side that is equally as important. Kali Demos their speakers in every type of room from hotel rooms and total project studios to higher-end studios and each room changes the sound of their speakers. What’s really cool is by using Sonarworks Reference 4 Kali Audio is able to correct the room and help their speakers along in producing the sound that they are built to make and ensure the speakers are performing the best they can in any room. The Lone Pine Series is designed to allow you to hear every detail that’s happening in your mix. Leave us a ton of questions in the YouTube Comments Lee and Nathan have agreed to answer any specific questions you may have! Don’t forget to enter to win the pair of Kali Audio LP-8 Monitors & Sonarworks Reference 4 Studio Edition above. I’d like to thank our friends over at Sonarworks and Kali Audio for providing us with this marvellous bundle to give away to our amazing community!